In a video aired Monday night on Al-Jazeera satellite station, leading Muslim Brotherhood member Mohamed El-Beltagy said Egyptian authorities have no shred of evidence the group engaged in any terrorist acts, as alleged by the Egyptian government. El-Beltagy, himself facing charges but not yet arrested, urged detained members of the Brotherhood not to answer questions by investigators as authorities, he says, "lack legitimacy". Like many of his counterparts in custody, El-Beltagy was charged early July with inciting violence at the Republican Guard Headquarters protest where the Egyptian army shot-down over 50 supporters of ousted Islamist president Mohamed Morsi, saying the supporters attacked the military building to free Morsi. Morsi, who is charged with espionage and prison break, has been held incommunicado at an unknown location since his deposition by the Egyptian army on 3 July following mass nationwide protests against him. A volley of other charges against El-Beltagy were placed by the Egyptian prosecution as he took part in a Brotherhood-led protest camp in Cairo which lasted for about six weeks before being violently dispersed on 14 August. The charges include attempted murder and forming a "terrorist gang" at the protest camp. The outspoken Brotherhood member questioned the allegations and pointed out that current Army Chief Abdel-Fattah El-Sisi – who led the move against ousted president Morsi – was chief of military intelligence before being promoted to defence minister by Morsi, questioning why El-Sisi accepted serving under an allegedly terrorist parliament. Egypt's now dissolved upper parliamentary house, the Shura Council, was dominated by the Brotherhood and became the primary legislative authority since the lower house People's Assembly was dissolved in early 2012. "Why hadn't he noticed anything related to the terrorism of the Brotherhood all these years?" El-Beltagy asked in the video. "How was he head of military intelligence and yet allowed a member of a terrorist group to be nominated for president?" El-Beltagy went on, referring to Morsi's ride to office on a Brotherhood ticket. El-Beltagy defied authorities to point out one incident where arms were used by Brotherhood members. "How can we have weapons and not use them in defending our sons and daughters?" he asked. El-Beltagy's daughter, Asmaa, was killed during the violent dispersal of the sit-in in Cairo. The son of the group's supreme guide was also announced dead the day of the dispersal. El-Beltagy then insisted that not one leader of the Brotherhood resisted arrest and said that terrorist groups usually claim responsibility for their operations, which the Brotherhood, he says, hasn't done. The Muslim Brotherhood repeatedly said it had no links to any acts of violence carried out across Egypt after Morsi's deposition. Despite this, many armed attacks against police stations, government buildings and churches erupted after Morsi's ouster on 3 July and spiked after his supporters' protest camps were dispersed. Men armed with automatic weapons were seen among pro-Morsi protesters on numerous occasions. Making a strong accusation, El-Beltagy charged El-Sisi of killing his own soldiers to "cover up massacres against Egyptians". El-Beltagy claimed the army killed 25 of its own conscripts on 19 August in Sinai to transform what he said is a political situation into a security situation. The 25 conscripts were reportedly killed by unknown assailants as they travelled unarmed on vacation. Since Morsi's deposition, dozens of army officers and conscripts were killed by militants in Sinai, apparently in retaliation to his ouster. El-Beltagy was recorded in the large Rabaa El-Adawiya protest camp saying that the Sinai attacks would immediately stop as soon as Morsi is reinstated, which remains the main demand of pro-Morsi protesters to this day. Security forces killed at least 900 protesters and injured thousands more during the dispersal and the protests which erupted as a consequence. Dozens of the Brotherhood's leadership – including Supreme Guide Mohamed Badie – and over 1000 of its members were detained by police during the past week and face charges of inciting violence. 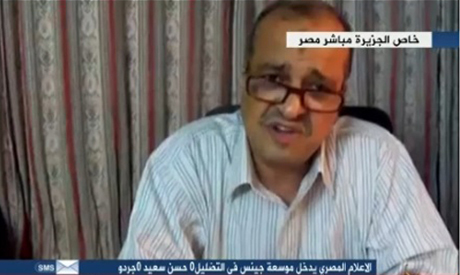 El-Beltagy was last seen on 14 August, the day the Rabaa El-Adawiya protest camp was dispersed. When will the MB stop lying? They cannot be religious at all, otherwise they would respect the Islam's rule not to lie. They are not lying. He's telling the truth. It makes sense, if they had weapons they would not have allowed Morsy to be removed. Or their buildings to be burned down.